The training took place in Horsjo, Norway and there were present 33 participants from 19 different countries. This training course was funded in framework of KA1, Erasmus+. Some memories of Ingrid “ After several hours of travell ing we finally arrived in Horsnjo. The beautiful location in the middle of the Norwegian mountains where the training ‘ F acilitaid’ would take place. After putting the luggage in our hotel room we found a perfect moment to explore the rest of the hotel; dur ing this we found that there were many more things in the hotel then just the rooms, restaurant & conference rooms. Besides a nice big living room with a real fireplace, there was even a sauna , swimming pool & table tennis table. So more then enough things to keep us entertained between the seminars. The next day everybody woke up early to discover breakfast a nd meanwhile enjoy the amazing view from the restaurant. When everyone had finished their breakfast it was time to start the training. We started wi th several introductions, where after we continued learning each other better by practicing names in different ways and playing se veral group building exercises. After lunch it was time to start to work more on the topic of the course ; an introduction to E rasmus+, the goals of the training & the agenda for this week was day by day explained. After having discussed most of the main topics it was time for us to get introduced to ” X – Peeriment” , a task where we had to work in small groups to design & prepared a workshop of 1 hour o n a self chosen topic. After working the rest of the day on the workshops, we became participants in the workshops that were designed by the other participants the next 2 days. When all the presentations where done , we already came to the last day of the training. During the training there were not only workshops & seminars, but we were also lucky enough to be able to join in some fun activities. We had the chance to enjoy the beauty of Norway during walks in the neighbourhood of the hotel and to have an afternoon trip to Lilleham m er was prepared for us, where we could see the ski jumps of the Olympic games made a nice walk around Lilleha m mer centre. Also in the evenings there were several activities organised. 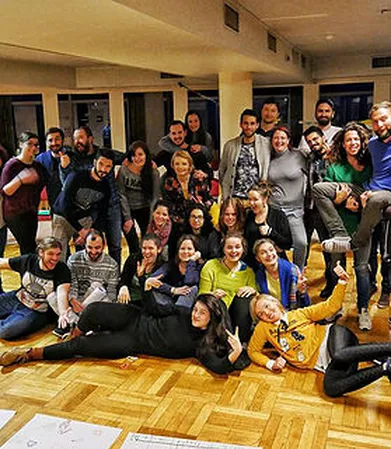 There was a change for us to enjoy 2 inter c ultural evening s (because of the big number of countries represented, the intercultural evening was split in 2) , where every country could present themselves in a creative way. For this the participants of every country were asked to bring some snacks or d rinks with them typical for their home country and have been given a task on what to present and in what style. This resulted into surprising combinations; Turkey was presenting their country as Ballerina’s, Slovenia dancing their national dance, Czech republic were presenting how they watch football while also presenting their 3 most common lies, Italy teaching us to how to make pasta, Poland showed us a story that could only happen in Poland (the legend of Krakow) and for us Belgium was the task to introduce everybody to a strange Belgium food while making squats. After every country had their presentation it was time to start tasting all the food, snacks & drinks from the different countries. The evening ended with chatting and enjoying music made by som e of the participants who know how to play the guitar and/or piano. An other evening there was a Norwegian night where we had a guest who came to tell us about Norway during the Norwegian night (since we somehow didn’t have native Norwegians in the group) We learned about the traditions, trolls, history, nature, food and many more things. By the ending of his presentation we got the surprise announcement that the Nordic Light were visible, so everybody enthusiastically put on their warm cloths to run outsi de for a second try after missing out yesterday. Unfortunately the Nordic light was not strong enough to be seen very clearly all the way in Hornsjo and it looked like some white smoke, although it was clearer to see on some pictures. This entry was posted in Blog, Training and tagged codec, europe, norway, training. Bookmark the permalink.